The IG Report is just that, a report. Its opinions or recommendations do not carry the weight of law. Each piece of evidence found in it would have to undergo the same individual rules of evidence in being admitted into court as any other piece of evidence would. The Attorney General can act on those findings by firing people, causing evidence to be shown to grand juries, or further the investigation by appointing a special counsel. Take note, “political bias” is not an element of proof in the charge of perjury, or most any other statutory crime. 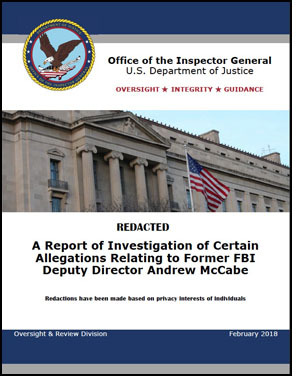 If the IG Report is a whitewash, it is up to the Attorney General to certify that it is by doing the least, rather than the most, to restore the FBI’s (and DOJ’s) good name in the eyes of the America people. At that point, all the prior discussions about whose side Jeff Sessions is on will be resolved. One side, which I call the Lou Dobbs’ side, thinks one way, while I, and a few others I can name, think otherwise. On the day of the report’s release Rush Limbaugh’s knees buckled, forgetting what I just wrote in my opening three lines. For, if this is true, then other things must also be true, leaving aside the central question of whether Jeff Sessions is competent or has merely chosen sides with the Establishment. For one, against overwhelming evidence in the IG Report of serious misconduct inside the top floor of the FBI for several years, if left unpunished, the reputation of the FBI will be forever tarnished in the minds of the American people. They may as well hand the agency over to the Chicago Police Force. Real crimes were committed and no amount of “mere” firings will cleanse that. Good people in the agency will be quitting at a faster rate than the felons. Pro-Jeff Sessions thinking has always believed he would not allow that to occur. I was in that boat, and will remain in that boat until Sessions plays that final card. Which will be very soon. At that time, if this occurs, this then becomes a debacle, a debacle falls into the lap of the President, for public confidence in him will also flag if he provides even the least amount of cover for this kind of behavior. I’ve been wrong before, but am also man enough to admit it…when the time is right. There are several cards Jeff Sessions can play, and either will or won’t play very soon. Next post What If? Are Chili Rellenos the Answer?